Thanks for visiting! Your pics are great! What decorations!!! Love them! I am following you now. I love it. Those are the best I've seen! Reminds me of my Mom's house, she decorates for everything. I really should too. LOVE IT! Wow what nice decorations- my children would have a ball..which why pur decorating is low key since they'll destroy it all!! Your daughter loks like she had a wonderful time. Your Wordless Wednesdays rule. What cute Holiday photos. I am coming by today THURSDAY from Parenting By Dummies to follow some new blogs. So I'm following you now. 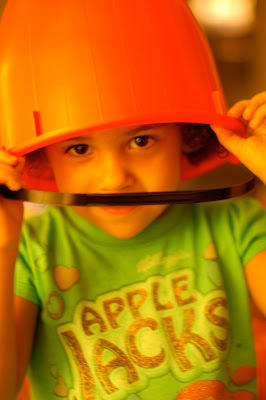 Pumpkin bucket on the head is priceless! Those shots will be classics when she's grown!